We love our Beer MuZeum. If you’re a collector of “Breweriana,” you’ll want to stop by and see our collection. We have a huge collection in our 2nd floor area that covers 2200 sq. ft. Plus there are many items to be found on our 1st floor. Or maybe you just have a ‘man cave’ or recreation room where a beer tap of your favorites would add a bit of ambiance to your decor. 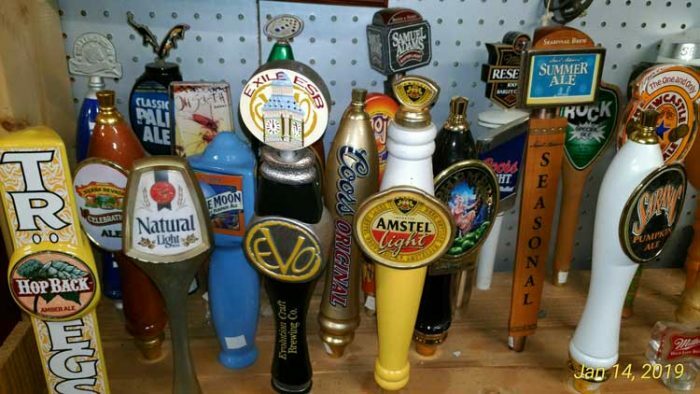 Besides beer taps, we also have mirrors, beer cans, trays, lights, signs, and more. We look forward to having you stop by and browse our breweriana. After all, if our State Comptroller Peter Franchot can stop by to see us, we know you’ll love it. Yep, we’ll be watchin’ for ya!